Waterstone Retail Development has begun construction of Broadway Crossing shopping center scheduled to open this winter. Located on Rte. 28 (Broadway) on the Lawrence/Methuen city line, the 60,000 s/f community retail center will feature a desirable tenant mix including Save-A-Lot Food Stores, the national leader of extreme value grocery stores, the popular Family Dollar, auto giant O'Reilly auto parts and several other specialty retailers and restaurants. Leasing opportunities are still available for space ranging in size from 2,000 s/f to 3,600 s/f well suited for services, apparel, entertainment and restaurants. Two outparcels totaling 7,000 s/f are also available with excellent visibility from Rte. 28 and are sub-dividable. According to Lee Anne Klemyk, Waterstone Retail's national director of leasing, "Waterstone has taken the lead in rebuilding the former dormant Malden Mills factory site into a vibrant community retail center. Broadway Crossing will feature a synergy of tenants to meet the daily shopping and services needs of the diverse urban neighborhoods of Methuen and Lawrence." Broadway Crossing is located in the heart of a very densely populated trade area of more than 130,000 people (3 mile radius) drawing from both the Methuen and Lawrence markets. The center sits adjacent to Winn Residential' s new, contemporary loft-style apartment complex, Loft 550, featuring 75 fully leased units with an additional 62 units currently under construction. Polartec, the original manufacturer of polar fleece, also neighbors Broadway Crossing and employs 900 people. There are several highly populated neighborhoods surrounding the center including the adjacent Methuen and Arlington St. neighborhood which will be an integral part of its customer base. According to Josh Levy, principal of Waterstone Retail, "This location right on Broadway could not be a more perfect fit. Being adjacent to Loft 550 residential apartments and Polartec, and located right here in the heart of dynamic neighborhoods, Broadway Crossing will be a frequented destination for both the Lawrence and Methuen communities. It will not just to be a destination to shop and dine, but also a place for the local community to gather and feel at home." 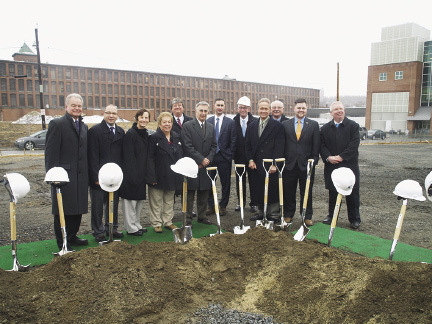 Waterstone and the city of Methuen celebrated the groundbreaking of Broadway Crossing on April 9. Plans for the project began in 2013 and the ground breaking represented a true collaboration with many entities present at the event including city officials, state representatives, members of the Merrimac Valley Chamber of Commerce, members of the Methuen and Arlington St. Neighborhood Association, Waterstone staff and the project team including general contractor DeStefano and Associates and civil engineers, Level Design Group. Linda Soucy, founder of the Methuen & Arlington Neighborhood Association (M.A.N., Inc.) said, "Since the beginning, Waterstone has collaborated with all of us here at M.A.N., Inc. through every step of the project. 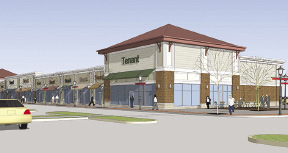 It will be invaluable to this community to have a place to shop, dine and gather all within a short walk from home." Methuen mayor Steven Zanni adds, "I am pleased to hold this groundbreaking for a new retail center in the city of Methuen. Broadway Crossing will bring some great shopping options to our city in a convenient location on Broadway at the Methuen/Lawrence line." Headquartered in Needham, MA with a satellite office in Spartanburg, SC, Waterstone Retail is a privately owned real estate company specializing in the new development of shopping centers and redevelopment of existing properties in the Eastern U.S. Waterstone owns over 50 properties totaling more than 3.5 million s/f of existing space and 1 million s/f under development including new projects in Seabrook, Epping, Portsmouth and Rochester, N.H. and Scarborough, Me.